This is the latest accepted revision, reviewed on 26 January 2019. 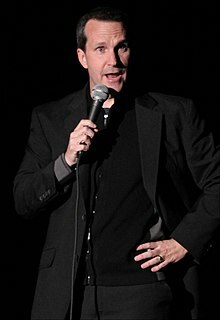 James Ronald Pardo, Jr. (born July 28, 1966) is an American stand-up comedian, actor, and host of the long-running comedy podcast Never Not Funny. From the show's inception and until mid-2015, he performed as the Conan O'Brien program Conan's warm-up comedian and cast member, after which he received a general development deal with O'Brien's production company. He last hosted the game show Race to Escape on the Science Channel. Pardo was born in Chicago, Illinois, and spent his first 8 years living on the south side, eventually moving to the south suburbs of Chicago. He spent his grade school years living in Hometown, Illinois. In 1980, his family moved to Oak Forest, Illinois where he attended Oak Forest High School. In 1986, he moved to Pasadena, California to attend the American Academy of Dramatic Arts. He attended for one year, then returned to Chicago to pursue a career in stand-up comedy. In late 1988, Pardo started performing at open microphones at various venues around Chicago, including "The Roxy", "The Last Laugh" and "The Comedy Cottage". The plethora of successful comedy clubs in the area at that time meant Pardo started earning money almost immediately, allowing him to quit his day job as a sales rep for MCA Records. In addition to his comedy CDs Uno, Pompous Clown and Sprezzatura, in 2007 Pardo appeared on the comedy compilation CD Comedy Death-Ray. Pardo hosted GSN's National Lampoon's Funny Money from June to October 2003, and later co-hosted AMC's Movies At Our House with Rachel Quaintance for 5 seasons. Pardo was the warm-up comedian for The Tonight Show with Conan O'Brien after being suggested by head writer Mike Sweeney. He has returned as the opening act for Conan, and appeared in a recurring on-air sketch throughout the week of April 11, 2011. In May 2011 he began conducting backstage interviews with celebrity guests for a web series called "The Pardo Patrol." After doing live talk and game shows at such Alternative comedy venues as the Upright Citizens Brigade Theater, Jimmy Pardo began the award-winning podcast Never Not Funny at the urging of now-producer Matt Belknap. The show is in its twenty-first season and placed Pardo among the founders of comedian podcasting. Pardo has been called a "pioneer" of podcasting. Never Not Funny primarily features fellow comedians in improvised conversations. Many of his guests have gone on to host their own podcasts, including Doug Benson, Scott Aukerman and Paul Gilmartin. In September 2013, Pardo released a comedy album entitled Sprezzatura. Pardo is married to comedy writer Danielle Koenig, daughter of actor Walter Koenig. They have one son. ^ Israel, David K. (April 30, 2009). "Creatively Speaking: Jimmy Pardo". Mental Floss. Archived from the original on June 15, 2011. ^ Johnson, Seth (January 25, 2017). "How the Bob & Tom Show Made Jimmy Pardo". Nuvo. ^ "No Couch For Richter?? A Report From A TONIGHT SHOW WITH CONAN O'BRIEN Test Show!!". Ain't It Cool News. May 27, 2009. ^ "Andy's Sidekick 04/11/11"[permanent dead link]. Team Coco. April 12, 2011. ^ "The Pardo Patrol". TeamCoco.com. Retrieved July 16, 2013. ^ "Never Not Funny". pardcast.com. Retrieved July 16, 2013. ^ "Jimmy Pardo is Conan's warm-up guy -- and podcast pioneer". Los Angeles Times. May 13, 2011. ^ Dowling, Kyle (January 23, 2013). "Comedian Jimmy Pardo Wins With "Sprezzatura"". The Huffington Post. This page was last edited on 26 January 2019, at 02:40 (UTC).